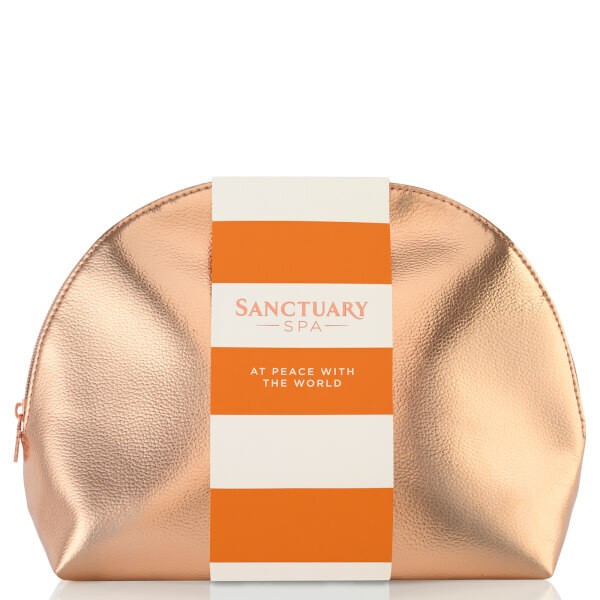 Balance your body and mind with the Sanctuary Spa at Peace with the World Gift Set, a trio of skincare treats to uplift the senses. Bursting with nourishing ingredients and intoxicating scents, the gift set helps to leave you calm and refreshed from top to toe. A daily body scrub that gently polishes and exfoliates with natural pumice. Smoothing and refining, the gel-scrub gently sloughs away dead skins cells and is delicately perfumed with essential oils for an uplifting and refreshing cleansing experience. Skin is left feeling soft, smooth and supple. Body Butter: Massage generously into skin before dressing to leave your limbs feeling butter-soft. Body Wash: Aqua (Water), Paranum Liquidum (Mineral Oil), Glycerin, Isopropyl Myristate, Ceteareth-20, Phenoxyethanol, Glyceryl Stearate, Benzyl Alcohol, Ethylene/Propylene/Styrene Copolymer, Polysorbate 60, Parfum (Fragrance), PEG-100 Stearate, Acrylates/C10-30 Alkyl Acrylate Crosspolymer, Disodium EDTA, Magnesium Aluminum Silicate, Persea Gratissima (Avocado) Oil, Prunus Armeniaca (Apricot) Kernel Oil, Hexyl Cinnamal, Linalool, Butylene/Ethylene/Styrene Copolymer, Limonene, Sodium Hydroxide, Benzyl Salicylate, Benzyl Benzoate, Coumarin, BHT, Citral. Body Scrub: Aqua (Water), Sodium Laureth Sulfate, Glycerin, Cocamide DEA, Lauryl Betaine, Sodium Chloride, Parfum (Fragrance), Phenoxyethanol, Sodium Benzoate, Citric Acid, PEG-70 Mango Glycerides, Tetrasodium Glutamate Diacetate, Butyl Methoxydibenzoylmethane, Aloe Barbadensis Leaf Juice, Sodium Hydroxide, Hexyl Cinnamal, Linalool, Limonene, BenzylSalicylate, BenzylBenzoate, CI 15510 (Orange 4), CI 14700(Red 4). Body Butter: PEG-8, Zeolite, Sucrose, Kaolin, Glycerin, Zinc Oxide, PEG-220, Parfum (Fragrance), Silica (Nano), Hexyl Cinnamal, Linalool, Limonene, Benzyl Salicylate, Benzyl Benzoate, Coumarin, Citral.